A little over two weeks ago in the final hours of the Knesset session, two laws were passed, two laws that filled Rabin Square. The first two weeks ago and the second tonight. The crowds were very different but the anger and disappointment were not. The first was the law on government funding of surrogacy- an amendment that would have included gay men in the bill was introduced, and after publicly promising to support the amendment Prime Minister Netanyahu voted against it. He quickly united the LGBTQ community and after a day of strikes, a rally was held that filled the square. While the purpose of the rally was to protest the issues of gay surrogacy-there was an underlying feeling as expressed by many of the speakers that more was at stake. Tonight’s rally was different as I wrote in my Newsweek article, most of those on the left and center opposed the law. I thought it was not needed and would just hurt Israel’s image in the world for no good reason. I did not anticipate how the non-Jewish minorities in this country would feel, especially those who have clearly tied their future and identity to the state of Israel. The Druze community felt they had been stabbed in the back. Bibi’s supporters argue that the bill does nothing to hurt their rights, however, it clearly gives Jews greater rights without protecting these same minorities. It also removes Arabic as an official language of the country. The Druze, however, do not take to the streets quickly. They first tried to find a common ground with Netanyahu and negotiate a change. Preferably for everyone, but maybe just for their own community. At some point this week Bibi decided it was in his political interest (for reasons that I do not fully understand) to turn the Druze, into our enemies. He held a meeting on Thursday night ostensively to work out a deal, but in fact, he blew up the meeting claiming that Amsam Asad had brought up Apartheid saying Israel was an Apartheid State. When in fact it was Bibi who brought up a Facebook post that Amsam Asad had put up warning that the law could lead to an Apartheid State. He demanded an apology and when Asad, a reserve brigadier general refused, he walked out of the meeting and Bibi lied about what took place. The rally itself was very different from any rally I have attended. First of all, there were the Druze. They had come in the thousands. Two hours before the streets of the city were filled with buses and cars bringing tens of thousands of people. The rest of the participants were a completely different crowd than that which turned out two weeks ago. It was my generation that filled the square and not the 20 and 30-year-olds who had come out for LGBTQ right two weeks ago. 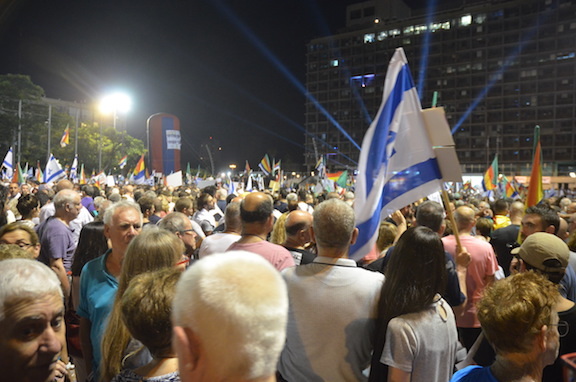 My estimate is that there were 100,000 people in the Kikar tonight- some are saying 250,000 but I doubt that number but maybe. The rally began with one of the organizers reading the Declaration of Independence and ended with tens of thousands of Druze singing Hatikva. The Druze spiritual leader Sheikh Mowafaq Tari, who had never before spoke at a rally stated” Despite our unreserved loyalty, Israel doesn’t see us as equals,” The theme was simple we accept this is a state of the Jews that we live in, a state that we have given our total allegiance to- however as much as it is the national homeland of the Jewish people we want to have full and equal rights. The rally and events of the last two weeks bring into sharp focus what does a Jewish state mean, what does it mean to be an Israeli and what is equality. What will be the longterm consequences I truly do not know but for his political survival Bibi seems willing to pull the Temple down on all of our heads.